Moses and Aaron, Nadab and Abihu, and the seventy elders of Israel went up and saw the God of Israel. Under his feet was something like a pavement made of sapphire, clear as the sky itself. But God did not raise his hand against the leaders of the Israelites. They saw God, and they ate and drank. The Lord said to Moses, "Come up to me on the mountain and stay here, and I will give you the tablets of stone, with the law and commandments I have written for their instruction." 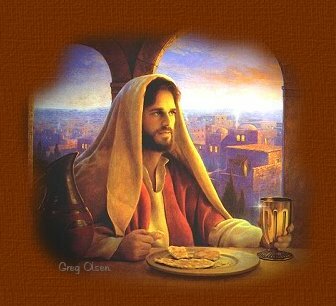 When Jesus had finished speaking, a Pharisee invited him to eat with him; so he went in and reclined at the table. But the Pharisee, noticing that Jesus did not first wash before the meal, was surprised. Then the Lord said to him, "Now then, you Pharisees clean the outside of the cup and dish, but inside you are full of greed and wickedness. You foolish people! Did not the one who made the outside make the inside also? But give what is inside to the poor, and everything will be clean for you. "Woe to you Pharisees, because you give God a tenth of your mint, rue and all other kinds of garden herbs, but you neglect justice and the love of God. You should have practiced the latter without leaving the former undone. "Woe to you Pharisees, because you love the most important seats in the synagogues and greetings in the marketplaces. "Woe to you, because you are like unmarked graves, which people walk over without knowing it." One of the lawyers answered him, "Teacher, when you say these things, you insult us also." Jesus replied, "And you lawyers, woe to you also, because you load people down with burdens they can hardly carry, and you yourselves will not lift one finger to help them. "Woe to you, because you build tombs for the prophets, and it was your forefathers who killed them. So you testify that you approve of what your forefathers did; they killed the prophets, and you build their tombs. Because of this, God in his wisdom said, 'I will send them prophets and apostles, some of whom they will kill and others they will persecute.' Therefore this generation will be held responsible for the blood of all the prophets that has been shed since the beginning of the world, from the blood of Abel to the blood of Zechariah, who was killed between the altar and the sanctuary. Yes, I tell you, this generation will be held responsible for it all. When Jesus left there, the Pharisees and the teachers of the law began to oppose him fiercely and to besiege him with questions, waiting to catch him in something he might say. To prepare a dinner or a supper and to invite people means the same as giving people something to eat and drink, or giving them bread and wine, namely, to do good to our neighbor and to teach what is true, and in this way to be bound together in love. However, if we do these things in order to be rewarded, we do not do them for the sake of goodness and truth, and so we do not do them from the Lord, but for the sake of ourselves and the world, and therefore from hell. But if we do them, not in order to be rewarded, but for their own sake, namely, for the sake of goodness and truth, we are acting from the Lord, who is the source of the goodness and truth in us. Picture the scene. You have invited a visiting minister to dinner at your house. Everyone in the house washes their hands before dinner, but your honored guest simply sits down at the table--and you know he's been out in the streets among the crowds, where there are plenty of germs to pick up. You think it's strange that this supposedly enlightened person has skipped such an obvious step before eating. Doesn't he have better manners and sense than that? Perhaps this so-called "minister" isn't very enlightened after all. You semi-tactfully mention to him that perhaps it would be a good idea to go wash his hands. And you walk right into a hornet's nest! All of a sudden, this guy is pointing out all your faults--and doing it right in front of your family and the other guests you have invited to eat with this important personage. How embarrassing! And how rude! Who does this fellow think he is? And the worst part about it is that he's hitting much too close to home. Those things he's saying . . . nobody is supposed to notice them. And if they do, they're certainly not supposed to mention them. Doesn't he know how polite society works? Live and let live. After all, everyone cuts corners here and there. And the fact is, we do have to take care of ourselves first. Later on we'll get around to all that other stuff about justice and love. What fun would life be if we didn't live it up a bit, and enjoy the perks of our position? This guy is no fun at all. I though it would be a real coup, having him under my roof. Very prestigious. But it's become a real fiasco. Wait. I see that one of my other guests isn't pleased about all this, either--and he's telling the guy so. Now he's getting ranked out, too! What a bust! We'll figure out afterwards how to take this cantankerous dinner guest down a peg or two. This, more or less, is the scene in our Gospel story. Now, I think I can speak for most of us in saying that if we were to invite someone to dinner, and that person proceeded to give us and our whole profession a severe dressing down, we would be very upset! And probably very angry as well. However, in this case, the cantankerous dinner guest is none other than Jesus Christ. And the story of that cantankerous dinner guest is found right in the Bible--which we are supposed to respect as holy. This puts us in a difficult position. Jesus was clearly engaging in rude and antisocial behavior. yet we cannot simply dismiss him and his behavior without discarding core teachings of the Christian Church about the sacredness of the Word of God, and about looking to the life of Jesus Christ as the primary pattern for our own life. This is just the type of conundrum--just the type of paradox--that the Jesus of the Gospels seems to like throwing us into. It is a Zen koan. The obvious answer must be wrong. And there is no obvious answer. This forces us (if we are willing to stay with the sacred text) to discard our familiar ways of thinking about things, and look deeper. In fact, the entire Gospel story--in fact, the entire Bible--is constructed by God specifically and masterfully to jar us out of our usual ways of thinking and acting, and set us on a new path. If the Bible all made sense to us immediately, it wouldn't be doing its job. So here we are, once again, faced with a Jesus who is acting in a manner that would deeply annoy and offend us if he were to act that way today, in our house. And let's grant that he is acting that way today, in our house--or at least in the "house" of our minds. The Bible is not merely a story of some colorful characters who lived several thousands of years ago. It is God's word to us, today. And this story is talking to us, today. What is the message it is trying to get through to us? Of course, we would all like to identify with Jesus in the story. After all, we are the one whose life is so pure that we can point out the faults in others without a trace of hypocrisy, right? Well, I think every one of us has at least enough awareness of our own faults that we would not try to maintain this position. Jesus may have lived the perfect, sinless life, but which of us would claim to be doing the same? No, my friends, I'm afraid we are going to have to bite the bullet and admit that if there is anyone in the story that we must identify with, it is the Pharisees and lawyers whom Jesus is dressing down. Instead of being the perfect paragon of righteousness and love, we all, if we are honest, must admit that there are times when we don't practice what we preach. We bind heavy burdens on others, pointing out their faults and looking down on them because they aren't as good as we are, and yet we won't lift a finger to face some of those very same faults in ourselves. We live comfortably in our own minds, assuring ourselves that we don't have the problems--it's those other people who are all messed up. And so we spend more time complaining about how everyone and everything around us ought to change, while neglecting to work on the one person we can change: ourselves. Now we're beginning to see more of the context of that rude display by the cantankerous dinner guest. The fact is, everything Jesus said and did was for a purpose. He had a job to do--and he didn't have much time to do it in. Thirty-three years to change the course of spiritual history for the entire world; for the entire universe. And just three years of public ministry to bring his message to the people of Palestine--that crossroads of the world--and through them to the rest of humanity. Three years. Three years to bring the message that the kingdom of God was at hand, and that people must repent--must change their ways in order to accept God's kingdom to avoid being destroyed by their own worldliness and selfishness. He couldn't afford to waste any time with irrelevant social niceties. There was critical work to be done. We get the sense that the dinner had barely begun when Jesus launched into his tirade against the Pharisees and lawyers. Didn't he know that it was considered essential by these people to wash one's hands before eating? Of course he did. He knew the customs of his people. Was he baiting them by not washing his hands? He very well may have been. He must have known that these scholars of legal minutiae would notice, and pounce on him, for not following their customs and laws. We get the sense that he intentionally set things up for a conflict. It would have been a simple matter to wash his hands before the meal--and all could have proceeded peacefully. But he didn't. And when the Pharisee, his host, expressed amazement at his flagrant violation of religious custom, he had a ready answer. He turned the tables on those social leaders who thought they were the most righteous of all, pointing out in sharply defined words and images just how far away they were from the kingdom of God that they claimed to own. What was he trying to accomplish? Didn't he know that these people would get angry at him? Didn't he know they would turn against him? That they would, in fact, crucify him precisely because of episodes such as these? Yes, he knew. He predicted well beforehand that the religious leadership would arrest and crucify him. He was under no illusions that his tough words would find fertile ground in their minds. And yet, he went ahead and spoke out anyway. Most of us, if we are faced with people who have power over us but who are acting in an unethical, immoral, and unspiritual way, will avoid confronting them about it. Whistle-blowers generally do not fare very well; and we have no interest in becoming the recipient of a modern day social and financial crucifixion. We take care to protect ourselves. But Jesus had a job to do, and nothing--not even the prospect of his own death at the hands of those he was sharing dinner with--would turn him away from doing his job. "For this reason I was born, and for this I came into the world: to testify to the truth." Of course, when we are sworn in at the courtroom, we figure it is our job to "tell the truth, the whole truth, and nothing but the truth, so help me God." Even the painful and embarrassing parts. But the rest of the time, we'd rather hold back in many situations where "politeness" requires that we not tell the truth, the whole truth, and nothing but the truth. Jesus, on the other hand, was "sworn in" for his entire life. He was spiritually pledged to God always to tell the truth, the whole truth, and nothing but the truth. This was the very reason he came into the world. And so, when the Pharisee invited him to dinner, he did not see it as an occasion to hobnob with the better classes, enjoy a fine meal, and get feather in his cap. He saw it as another opportunity to testify to the truth. And if we believe he was who he said he was--the son of God, who was one with the Father--then we must believe that everything he said about his hosts at that dinner was the truth. He was not merely complaining and blowing off steam, as we often do. He was telling the simple, unvarnished truth. And in an odd sort of way, this showed more respect for his hosts, the Pharisees and lawyers, than the crowd of people who regularly sucked up to them and told them what they wanted to hear. When we tell people what they want to hear, we are generally doing it, not out of respect for them, but for what we hope to gain by currying their favor. We don't really respect or care about them--not about the deepest part of them: their inner self, their immortal soul. We care about keeping harmonious relations with them, so that our own life may go forward peacefully, without conflict, and perhaps with a bit of profit for ourselves. Jesus didn't care what these people could do for him. He had no regard whatsoever for the positions of social power and authority they could confer on him if he played their game. He had no interest in flattering them in order to curry their favor. Rather, he did them the favor of looking into their souls and telling them truthfully what he found there. He laid it all out for them, and then left it up to them how they would react. He gave them the respect of at least considering the possibility that they might be willing to look truthfully at themselves, and change their ways so that they would be headed to heaven instead of to hell. Most of them reacted with jealousy and anger. But we know that his strong words got through to at least a few of them. He did gain some followers from among the wealthy and influential classes. Nicodemus. Zacchaeus. Joseph of Arimathea. These three from the upper classes were among those who had their lives turned around through their encounters with Jesus. And if Jesus had gone along with their rules, these people would have gone to their graves still untouched by the grace of God; still heading for the hell of the hypocritical. How will we hear Jesus' strong words? How will we react when we read the Bible and find that it is pointing out all our faults? All our shortcomings? How will we react when our religion and our God require us to repent, give up our faulty attitudes and addictions, our self-righteousness and destructive indulgences? Will we, like the bulk of the Pharisees and lawyers, oppose our Lord fiercely, arguing for our own righteousness? Looking for loopholes through which we can escape personal responsibility for our own behavior? Or will we allow those words to penetrate our soul, and root out the wrongs within us? Will we allow the Lord to turn our lives around, so that we can gain spiritual life? Amen.